We are not a gluten free home but the 8 year old daughter of a dear friend has the distinction of being only child in my cooking class that has the distinction of being severely gluten intolerant. So it was with some out of the box thinking that allowed me to co-op my Pesach chocolate chip cookie dough and morph it into hammentashen. Ok, not exactly your traditional “filled” hammentashen but rather a very nice alternative for those needing a doppelganger. I don’t recommend brands I don’t use my myself so have to say since trying the Pereg® Almond Meal Flour (and the Coconut Flour) I’m really hard pressed to use this recipe just for Pesach. 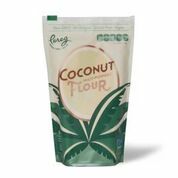 The texture and flavor are deliciously subtle and since the flours are non GMO and Vegan they kinda work for every recipe when I need to have a substitution. 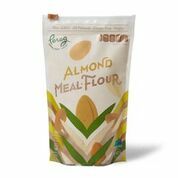 The flours are available at your local kosher grocery or on line at www.pereg.com. There are, of course other brands of these flours available BUT none that I know of are kosher for Passover too. 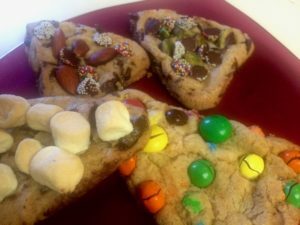 This is a COOKIE hammentashen recipe rather than a folded and pressed one and really simple to create. You will need to spend a little extra time shaping it while it cooks but the extra time is so worth so that everyone gluten free or not can enjoy the fun. NOTE: Amazing served warm with ice cream. Preheat oven to 350. Line 2 cookie sheets with parchment paper. In the bowl of an electric mixer or food processor combine the brown sugar, baking soda, salt, and butter, and mix until combined. Add the vanilla, egg, and flour mix to combine but don’t over mix. By hand, stir in the chocolate chips. Cover and refrigerate the dough for at least 1 hour. Using a small ice cream scoop place 12 scoops on the prepared cookie sheet. 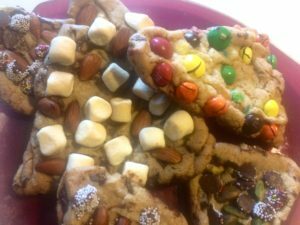 Using a metal spatula press the cookies down a bit and with a knife shape the cookie into a triangle. Bake for 5 minutes. Using the knife reshape the cookie (it will have spread) into a triangle. 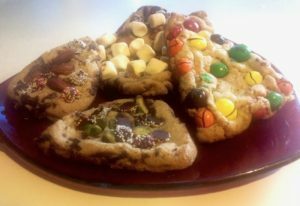 Sprinkle the topping of choice on the top of the cookie and and return to the oven. Bake an additional 5 minutes, reshape the triangle sides if need be with knife and bake until lightly golden but not overly brown. Let cool on the cookie sheet (reshape again if need be while the cookie is still warm. Let cool totally on the cookie sheet and then remove to a wire rack. Makes 20 to 24 depending on the size of the hammentashen.